One minute you are in a car going somewhere, then, suddenly, you are hit by a bad driver. Your daily life, which may have been busy before, now has the added burden of doctor visits, trips to the pharmacy, and physical therapy. What if you don't have health insurance? How is all of this going to get paid for? And if that wasn't bad enough, you are in pain. It may be your neck hurting from whiplash, or spasms in your back, a torn rotator cuff, or maybe you suffered cuts and lacerations. You may be forced to miss work, and have to worry about paying your bills. Grayson Law Firm has helped counsel numerous clients through these types of problems. We deal with those cold or callous insurance adjusters for you. We know how to make sure you are treated fairly. Like those adjusters, we know the rules of how insurance law works, and we will help use those rules to your advantage. Insurance adjusters get rewarded for how little they can pay out on a claim. Our fees are based on making sure you get adequate compensation. Whether you decide to hire us or another law firm, we strongly recommend that you get advice from a knowledgeable lawyer with extensive experience in handling car accident cases. Get that advice EARLY in your case. Call Mike at (406) 563-3195! Far too many times, auto accident victims make costly mistakes in handling their own claim. They may sign global medical releases, which allow insurance companies to 'go fishing' in the person's private medical history. Often they grant interviews to insurance adjusters and get asked tricky questions which are designed to lead you to accept fault for the wreck. Or perhaps they settle the case too soon, or for not enough money. The insurance adjuster is an expert in saving their company money on settlements. How much experience do you have valuing an auto injury case for settlement? Don't make the same mistakes. Most cases are handled on a contingency fee basis. Our fee is a percentage of the settlement, and we only get paid if we obtain a settlement for you, which means that you can have strong, competent legal representation even if you cannot afford to pay a retainer fee. We handle auto accident cases throughout Montana, and we will handle your case professionally, fairly, and aggressively. If you are unable to travel to our office, Mike will be happy to accommodate you by telephone appointments, or by traveling to your location to review your case. 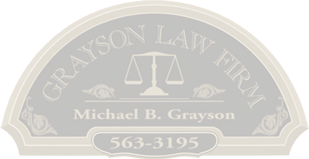 For a free, no obligation consultation on your automobile accident case, call our toll free number: (888) 888-3315 or email us at mbgrayson@graysonlawfirm.com.